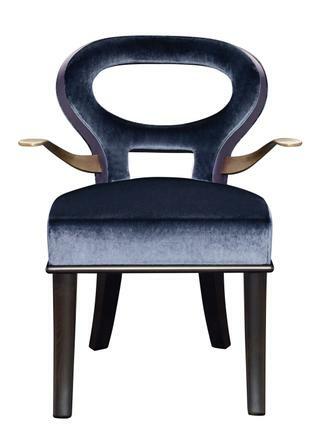 The Roka chair covered in velvet, with leather details and arms in hammered bronze. When four generations of a family are consumed with the love of working with one particular material, you can be confident that they have honed their craft accordingly. Such is the case with family-run luxury furniture business Promemoria, which was set up by a carpenter’s son, Romeo Sozzi, in 1988 in Lake Como, Italy and is now run by him and his three sons Stefano, Davide and Paolo. The family passion for working with wood started with Romeo’s grandparents, who ran a business restoring and repairing carriages for local nobility. His father in turn set up his own carpentry workshop, teaching his son how to work with the material before Romeo decided to branch out on his own and combine both parts of his heritage: creating upmarket pieces of furniture fit for the same nobility his grandparents used to work for, and using the skills he had acquired from his father’s tutelage. Romeo began specialising in beautiful handcrafted cabinets, and soon expanded his business to include a whole range of furniture and accessories, crafted in wood and other luxurious materials. Now that his own sons are on board, he has access to knowledge about the most up to date technological advances, ensuring that Promemoria is at the forefront of luxury furniture design. 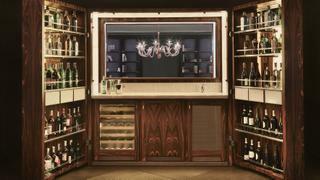 And what elegant furniture it is: using the finest materials, including Tuscan cypress, macassar ebony, Murano glass, Italian porcelain, silver, copper and bronze, and taking inspiration from sources as diverse as the Far East and the art deco movement, each collection is not only beautiful to behold, but also made to the highest quality. With nearly 200 products in the main collection, comprising tables, chairs, sofas, armchairs, lamps, cabinets, mirrors, screens, writing desks, outdoor furniture, and accessories, the company has come a long way from its beginnings as cabinet-making specialists and Promemoria now has showrooms and suppliers all over the world. The brand is still admired for the quality of its cabinets, thanks to the experience gained in Romeo’s early career, and they are some of the stand-out pieces in Promemoria’s impressive collection. The Nefertiti is a wooden and glass display cabinet that features three shelves and LED lighting to illuminate its contents, while the beautiful George cabinet is a similarly statement piece, covered in velvet with a glass front, shelves in leather, an inside covered in fabric and Murano glass handles. Another striking piece is the Amarcord modular cabinet, structured in wood, with wood or hammered bronze doors and LED-lit shelves or drawers. Other key pieces in the range, suitable for a yacht interior, include the Adriano modular sofa, which features several different sofa “building blocks” that can be assembled in any configuration, curved or straight. Another is the circular Tornasole dining table, which offers a nautical aesthetic thanks to its heavy wood and bronze detailing, plus marble top and radial inlay. 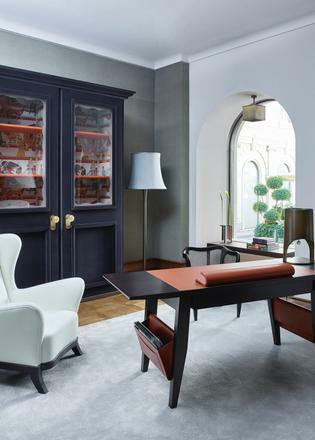 There is also the Bilou Bilou chair, a signature piece for Promemoria, made from beech wood and covered in velvet, and the similarly velvet-upholstered Roka chair, with beech legs, leather details and hammered bronze arms. As well as its main collection, Promemoria specialises in creating custom-made pieces, with no request too big or too small. Created to the same high level of craftsmanship as the rest of the brand’s pieces, if you have something particular in mind, you can rest assured it will be made to the same high quality Promemoria is known for.